The platform of efficient, customer-oriented transit organizations. TransitReserve is the cloud-based reservation system that manages your transport schedule, generates statistics and lets you collect customer feedback with custom surveys — with no server to set up or any software to install. Because TransitReserve is fully managed and comes with 24/7 support and a 99.9% SLA, you can focus on your customers instead of software management. Retrieve daily transport schedules with one click. 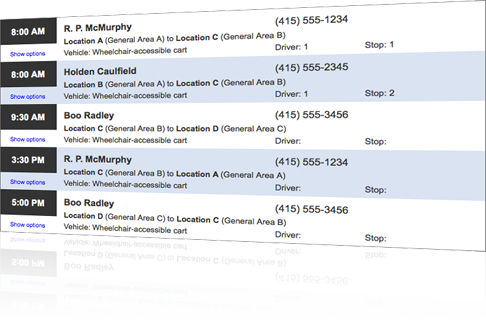 Check ride availability in seconds and eliminate scheduling errors. TransitReserve adapts to your environment; define pickup times, availability and pickup locations as reservation parameters and update them as your needs change. Create user roles to collaborate with other business units or to delegate responsibilities to your staff. Generate statistics for reporting and future planning. Define unlimited surveys to assess your performance. Enable your riders to make their own reservations and include their feedback in your organization's roadmap. © Copyright 2010-2014 TransitReserve LLC. All rights reserved.